Kristen Davenport and her husband, Avrum Katz, work their family farm, Boxcar Farms, in Llano in the Sangre de Cristo Mountains of southern Taos County. That is a sentiment with which Kristen Davenport of Boxcar Farms would agree. Although “the potato lady,” as she is sometimes called, says it is impossible for her to choose a singular favorite food from the many that she and her husband, Arum Katz, grow in the wilds of Llano, her three favorites are garlic, potatoes and winter squash. This time of year, all three foods are abundant at growers’ markets across the state. And when your farm sits at 8,200 feet elevation in the Sangre de Cristo Mountains of southern Taos County, growing reliable crops is of critical importance, especially when you are a full-time farming family. Davenport, originally from Roswell, was a journalist; Katz, who was raised in upstate New York, was a high school teacher. 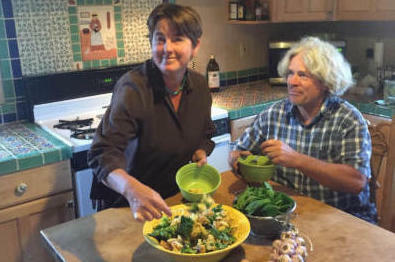 They met while working at a restaurant in Albuquerque in the early ’90s, and later sold Katz’s Manzano Mountain-grown garlic together at several growers’ markets. When Davenport’s reporting job took them to Santa Fe, they began farming together part-time and continued moving farther north. In 2003 and 2004 their children were born, and by 2006 they settled into their current location and started farming full-time. They now own 14 acres of irrigated land at their home and lease another 17 acres of irrigated land down the road at a property owned by Davenport’s sister. Their property has a spring-fed irrigation ditch with only a small handful of property owners on it. “We chose this land, which sits under the bald peak Jicarita, because of its secure water source and because of its incredible beauty and rich soil,” says Davenport. Davenport says the amount they farm each year varies, but typically they have six to seven acres under cultivation and maybe a couple more in cover crop. “We have been increasing our use of cover crops drastically the last year or two, and are having great results,” she says. Certified organic since 2013, Davenport and Katz make their own compost with manure from their goats and llamas, and hay from their neighbors’ fields. They also produce some of their own hay. Boxcar Farms’ primary crops are garlic, potatoes, winter squash, cabbage, root crops and some greens. Their garlic braids are some of the most beautiful found anywhere. You can find Boxcar selling potatoes and roots crops at the Santa Fe Farmers’ Market well into winter – at least through Christmas – because several years ago they built a built root cellar. Sitting 12 feet below ground, it is about 100 square feet and built of “ferrocement” – rebar and other metal mesh forms that hold up a thick layer of cement – with about three feet of earth on top of it. It keeps everything at a constant mid-30s temperature all winter. Full-time farming, especially while raising a young family, is challenging. But Davenport feels good about the foundation they have been providing for their children. “Our kids have grown up here understanding a lot about where their food comes from in ways that most American kids do not – they gather eggs, they milk goats, they go out in the field when they are hungry, pull a carrot and wipe the dirt off on their pants. I know their connection to the land and the food grown here is strong,” she says. It’s often said that growing food is a revolutionary act. Davenport firmly stands in this camp and wants her customers to join her. Boxcar Farms’ Green Gribiche combines potatoes, broccoli and a dressing of egg yolks, mustard, oil and herbs. “(We live) in an age of mega-chain stores and food you can print out with a printer and food filled with so many chemicals it cannot really be described as ‘food.’ We oppose any attempts by governments to control small-scale agriculture. We encourage our customers to grow their own food, and are happiest selling garlic, for instance, as seed, even if it means we have one fewer customer the following year. Everyone should grow their own food!,” says Davenport. Once you have fresh, locally grown food in your hands, the real fun begins. Take for instance, the idea of a French-inspired sauce gribiche, a mayonnaise-style cold egg sauce made by emulsifying hard-boiled egg yolks with mustard and a neutral-flavored oil. Classically served with boiled chicken or fish, Davenport’s “green” gribiche has become one of her go-to recipes. It is hearty, delicious and extremely adaptable to other vegetables such as green beans or kale. Serve it warm or serve it chilled – either way you’ll wonder why you never made it before. Denise Miller is executive director of the New Mexico Farmers’ Marketing Association in Santa Fe. 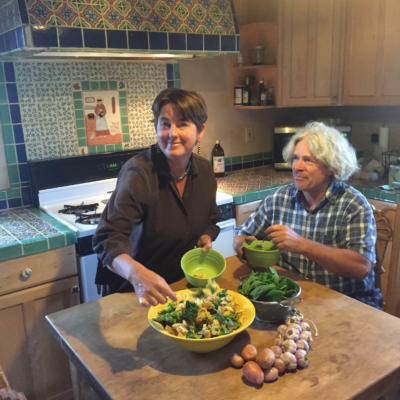 She writes “My Farmer’s Kitchen,” a column about New Mexico farmers and cooking with them. Visit farmersmarketsnm.org. 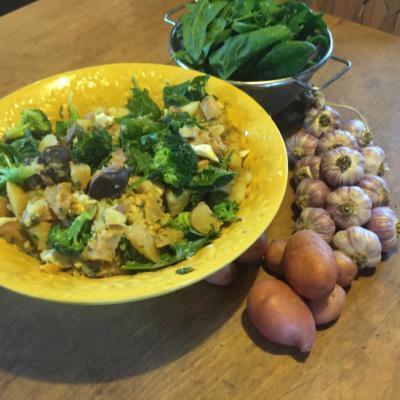 This recipe, adapted slightly from “Super Natural Every Day,” a cookbook by Heidi Swanson, is a family favorite, and a great way to use the abundance of the fall season when broccoli comes in, spinach is sweet and potatoes are at their peak. Chop potatoes into pieces no larger than your thumb. Coat in olive oil, salt and roast at 400 degrees for about 40 minutes. About 10-15 minutes before potatoes are done, toss the broccoli with a bit of olive oil and roast those for a while as well. Make the dressing by mashing the yolk of an hard-boiled egg and very slowly adding the 2/3 cup of olive oil, beating constantly, until smooth and glossy. Whisk in vinegar, mustard, shallots, herbs, and about half a teaspoon salt. Put the warm potatoes, chopped eggs and broccoli in a large bowl, pour the dressing over, toss and serve. We also chill this dish and serve later as a potato salad. If you are substituting spinach, there’s no need to cook it first – just pour the roasted potatoes over the spinach and the heat of the potatoes cooks the spinach just enough. This dish is even better the next day, and more beautiful if some of your potatoes are purple. Sometimes we add garlic to the dressing, because it’s garlic season, too. I’m planning on attending the market this Sat, the 17th. I’m primarily looking for purple potatoes! Might you have any of those?